Parenting through a PhD can be tough, but what about single-parenting through a PhD? Degree of difficulty = high! If you are in this situation is a PhD doable? You bet it is – but it’s likely your university could do more to help. Orla Egan tells us more. 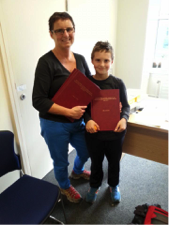 Orla just submitted her thesis for the MA in Digital Arts and Humanities in University College Cork and has finished the first year of her PhD programme in DAH. She works on the the development of a Cork LGBT Digital Archive and lives with her 8 year old son, Jacob, in Cork city. Orla blogs on her PhD and life at OrlaEgan. Its 8.30 in the morning and I’m just back from the school run. I have five and a half hours before I pick up my son. How to make the best use of that time? The eternal dilemma! As a single parent this time is precious. I have a long To-Do list, with everything ranging from cleaning the house, doing the shopping, washing clothes, reading that article for next week’s seminar, working on my website, writing my blog, maybe even getting in a quick run or swim! In 2014 I completed an MA in Digital Arts and Humanities and am now coming to the end of the first year of a four year PhD programme. I must be crazy! I read with interest Rebecca Turvill’s post on the Thesis Whisper on The positives of PhD parenting. I guess that’s what I am too – a PhD-Mum. The term ‘PhD-Mum’ foregrounds the fact that as parents we juggle and attempt to balance often conflicting demands on our time and attention. It is a far cry from the traditional image of the PhD student with nothing to do apart from spending years engaged in deep-thinking about their subject of choice. As parent-students we try to slot moments of study and reflection into very busy schedules, where we strive to produce stimulating innovative work while also managing to shop, cook, clean, wash clothes, do the homework and be there for our children. In my case this is even more challenging than the situation described by Rebecca. I am a separated parent, which for me on a day-to-day basis means that essentially I am a single parent. In the absense of another parent to share childcare and household responsibilities, practically and financially, I must try to schedule my study around the needs of my child. While this is the situation for so many student-parents, our universities often assume that graduate students have no other interests or responsibilities and can, at the drop of the hat (or the child in this case), head off to a day-long or weekend-long seminar / think-in / conference. I wish! Being a student is not generally a lucrative career choice. Having to pay for childcare or babysitting in order to attend a course or seminar is often not possible. My college offers me €15 a week towards childcare costs! Couse schedules are often challenging for single parents. Many classes are scheduled for late afternoon / early evening to facilitiate those who wish to attend after work, but this is a logistical nightmare for parents, particularly for seperated or single parents. During my Masters course I had evening/night classes or labs 3 nights a week. So how did I do it? It was possible only with huge support from friends and family. My father kicked in whenever he could with school pick ups and spending quality time with his grandson. I relied heavily on the support of a friend and fellow parent – my son spend so much time at their house that I think at some stages they believed that their family had expanded and that they now had three children! Another useful strategy is to learn, on occasion, to ignore the pile of washing or the dirty kitchen, and sit down at the computer when the child is at school. I agree with Rebecca Turvill that being a PhD-Mum does focus your concentration – if you only have a couple of hours to work before the school run you make sure you use it well. I also tried to include my son in some of my college life. He enjoyed coming to college to meet me after school, eating with my classmates in the college resturant, teaching them to play MineCraft and then coming to my lab with me in the evening. One of my lecturers, understanding the challenges I faced having to be at college 3 evenings a week, had agreed that I could bring my son to the lab with me. However the tutor was less understanding. Arriving to the lab one evening he confronted me and told me that this was not a suitable environment for a child. I explained that it had been cleared with the lecturer, but the encounter left me feeling uncomfortable and unwelcome. I suppose we have to remember that colleges are institutions that are made up of individuals, who will understand these challenges to a greater or lesser extent. It may relate to their own personal experiences and whether or not they are parents, and if they assume some or most of the parenting responsibilities. The success of many (usually male) academics would not be possible without the support of a partner at home who assummes prime responsibility for home and children. Perhaps our academic institutions need a bit of a shake up and perhaps staff in colleges need to be educated about the diverse circumstances and challenges facing students and on the importance of flexibility and support for student-parents. Some of this support was provided to me by my classmates. When I couldn’t make it to the lab because my son was sick, one of my classmates keep me in the loop, typing a running commentary to me on email of what was going on in the class while I simultaneously linked in via Google hangouts. Being a student also give me some degree of flexibility to be able to be there for my son. My four year PhD programme co-incides with the last four years of primary school for him, so we can be students together, even if his homework always has to be done before mine. I would hope that I am instilling in him a sense of the importance and value of education. Althought the amount of time I have to spend doing college work in my computer in the evenings does thwart somewhat my attempts to reduce the amount of time he spends playing MineCraft on his iPad! Being a student-parent is rewarding and stimulating, but the constant juggling is challenging and can be hard, physically, emotionally and psychologically. It is really important to remember to take time off, to have downtime, fun time, chillout time. If you don’t mind yourself and take time to recharge your batteries you won’t be able to do it. How about you? Are you single parenting your way through a PhD? We’d love to hear about your experience in the comments. This entry was posted in Getting things done, Miscellany and tagged PhD parenting. Bookmark the permalink. Congratulations on getting this far. You are modelling hard work and the joy of intellectual discovery for your son. I have parented my way through a PhD (see my previous blog post “Parenting your way through a PhD) with three sons and a mostly absent husband. At least he’s (sometimes) around to help on the weekend with the multiple sport runs, play rehearsals and so on, but in all the time I’ve been studying he has not cooked a meal or bought the groceries. He does his own laundry but no one else’s and every so often he tells me that the sheets on the bed need washing and “we” should do them more often. So – “wash them” I suggest. Doesn’t happen. I was working from home during school holidays and came back to find someone else had moved into my desk, shoving all my papers to one side. Even the academic administrators are unsympathetic about juggling parenting and study, and one of them is a female with four children of her own! So I sympathise with your situation. The bright side is that when you finish you’ll know that this is was ALL YOU! You won’t have to feel that you only got this done by leaning on others, it is ALL YOURS! All the best with your studies as you progress. Absolutely agree!! I’ve been a single parent for 12 years and have ‘struggled’ through grad degree, masters and after a year into my phd am now on extended leave to be there for my child’s final year of school! The added ‘stressor’ for me is that both of my children also have disabilities. I’ve become adept at submitting special consideration forms in advance of the need for me to ask for any extra assistance. Support that I’ve received has been dependent upon the understanding and attitude of each academic I’ve had- there doesn’t appear to be a standardised way of handling the needs of single parents! We need to change this!! Well done. What a great balance and pragmatic attitude you have. I’m not a single parent but do all home and child related stuff due to husbands hours. I’m heading into my 3rd year as my kids enter Infants and Primary school. Yes parenting brings a certain set of skills to the PhD, planning, multi tasking, assimilating information at lightening speed, setting early deadlines, no time for procrastination! Am I really advocating parenting as an excellent study aid 😉 My kids also love coming to uni and will do over the holidays while I do some work. Well said. I’m halfway (yikes) through a 3 year PhD, with three kids now aged 3, 6 and 8. I often feel like my parenting is completely invisible at uni – a feeling which was confirmed recently when a speaker at a seminar made a sweeping gesture of the room and described the career milestones that “we all” should aim for by the time we reached our “early 30s”. Those of us that had careers and families before starting PhDs – and are therefore in our late 30s at least – were completely invisible in that rhetoric. Attending national, much less international conferences is really tricky – but yet its incredibly important. I feel self-conscious always says “I can’t do X, because my kids…” – but that is my reality. And its not always can’t – sometimes I just plain don’t want to, because I need some family time. My mum did her PhD a few years before I was born while looking after two teenage step-kids. Thinking about how much work that must have been really motivates me when I study (I’m currently doing a research masters program, with a view to a PhD) to do the best that I can, considering how easy I have it in comparison. Wow, this resonates really well. I’m in my second year of my PhD and have been a single parent for my whole university career so far. I am already feeling like I’m going to finish late. No scholarship, just whatever casual work I can get combined with my family payments and I have to say the lack of funds just adds to the overall stress. It will be worth it though, even though I’ll be 40 when I’m done! Hiya Yes I know that one. I recently did my PhD in 4 years as a single parent. I had to be very determined and it certainly helped being passionate about my subject. It was difficult with moments where long term stress gave way to feeling ill. Luckily my life experience meant I have a lot of self help resources. My dept has policies around operating within core hours in order not to disadvantage parents, which helps a bit. Now though I’m finding the challenges of the post-doc and looking for new posts just as difficult. Moving for a job will have significant impacts and having periods without a post re asserts the stress. Rebecca, I find it really interesting that your department operates around core hours-something I always try to encourage at my own institution. Do you mind me asking where you’re based? I’d like to be able to show my University that this works and helps. Thanks for the reply! My Uni is signed up to Athena Swan also but it would seem this is so only within the science faculties. I worry about trying to find a job which suits my family situation once I’ve completed my PhD, if it’s this hard as a student to get things to work around my schedule how much harder will it be when (hopefully) working in Academia? I’m doing something that I’ve wanted to do for a long time ( had to wait for the younger one to start full time school before staring the PhD) and hopefully I’m setting a good example for them. Like all parenting, I’ll have to wait until they’re grown to see how it all turns out! Wow. Kudos to you, Orla, and to the other single parents, whether parenting and/or PhDing and/or working. I have written a bit about my experience of trying to manage my ecosystem of family, work and study – https://theeduflaneuse.wordpress.com/2014/12/05/work-family-fulfilment/ – but I have been able to do so with tremendous flexibility and support from my husband. Stop every now and then to marvel at your great work – the parenting as well as the research. And if you’re like me, your PhD will feel like a fulfilling intellectual sojourn, like stolen moments of ‘me time’ to be treasured and enjoyed. First, let me say you are all so inspiring and ought to be very proud of yourselves! You are all amazing and will get there in the end 🙂 I am not a single parent, but have worked through the hard slog of my phD while feeling like I had to beg, borrow and steal tiny increments of time wherever I could find them around my husband’s work and sports commitments. It has been far from easy. Added to this, which I know is not at all uncommon, I have had every major life stress/event – other than divorce and marriage – thrown at me in the 5 years it has taken me to get this far. (I am hoping to submit at the end of this year) Six months into my scholarship I discovered I was pregnant with our second child, a beautiful baby girl who did not appear to sleep for about two years. I took to breastfeeding and settling her one-handed while I banged away at my computer and battled endless fatigue and sleep deprivation. My partner’s business went through a period of crisis which took enormous chunks of time and energy away from my work and the time my husband could actually support me with childcare, etc. Financially, we struggled and often I could not afford childcare. Eventually we had to sell up and move house. A nightmare of a process with a phD, new baby, school age child and a struggling business to get back on track. When the dust finally appeared to settle, my Mum suddenly became very ill, and I gladly supported her and my Dad in every way I could until she passed away in our family home early this year within 3 months of being diagnosed with an aggressive cancer. Honestly, I almost threw it all in when my grief made me think I didn’t want to do it any more because it was all too hard, and what is the point anyway? But like all the other times before, I stopped and decided I am determined to push through all the moments of despair and sheer frustration. Because this is something I want to see through for myself, and because I will not let it get the better of me. Also, I am passionate about what I do, and I know my Mum would be so disappointed if I didn’t press on. Every day is a challenge, but its another step in the process necessary to get you over the finish line. You just have to keep going, and then you will get there. If you believe you can, you will. Even if its just one little bit at a time. Thank you for this great article, Orla! I am completing a Masters degree and starting a PhD programme in September. Also a single parent of a 12 year old and no family or care support here because we just moved into the city last year. It all resonates. All the comments have encouraged me – I am NOT alone!!! Kudos and all the best to you, and everyone else on this thread. Keep the spirits up, we WILL make it!! I am a single parent approaching submission in a few months. I’m surprised Orla’s University help with childcare at all, but it’s a good start! My own University used to have a means-tested childcare fund but this was cut shortly after I returned from maternity leave so I never benefitted from it. During my son’s first year in nursery the price went up by nearly 30 percent. I started my PhD engaged, had my baby at the end of my first year and when I returned in second year I brought my husband and then 1 year old baby with me for fieldwork to a rural mountain village in Peru for 6 months. Following the trip, my husband got depression, was hospitalised and assigned a crisis team. The marriage eventually broke down when his aggression evolved into physical violence. I could have left earlier if childcare didn’t eat up every single penny of my studentship after rent. I sometimes worry that other students with children might find themselves in violent marriages but cannot afford to move out of the marital home because of hardship. Ever since I had my child I’ve really struggled with deadlines because the cost of childcare hasn’t always allowed me to study full time hours despite my PhD being full time. For the last year, since my 4 year PhD funding ended, I have been paying more in childcare than I get paid (in benefits). I qualify to use a food bank, although I prefer to sell my belongings and to scrimp on socialising to get by. I’m a disabled student and my disability means it takes me a long time to physically type up my work. I’ve just gone over my write up year with a 3 month extension based on disability which was extremely, extremely difficult to get. I’m being charged £500 for the extension and at present have no idea how I am going to pay it. This all might sound a bit negative but there’s a good part! I’ve enjoyed my research and my supervisors are fantastic. I love being a Mum. I’m looking forward to finishing to get a break and to think about the future. I don’t think it’s a level playing field for women (or main carers of children in general), and especially for single parents. Academia might have lost me to be honest. That might sound a bit ridiculous but although my research might be slow, it’s innovative and of a high quality. I get frustrated that Universities do not do more to retain talented women in academia. Holding academic events after 5pm tends to exclude the full participation of parents (especially single ones) in academia. I once took my son to an academic event aged 3 and he was great. Nevertheless, the 2 women sat beside us decided to move seats shortly after we sat down. Ironically, the seminar was a shamanic leader discussing the sacredness of childbirth and women’s contribution to society in giving the gift of life. That one incident sums up my experience of finishing my PhD as a single parent really! I was really moved by your experience. I am a single mother thinking of starting a PhD next fall researching the experience of single mothers going to graduate school. Can we talk? or email? I just wanted to say, to you and all the other PhD-parents, especially single parents – I’m truly and deeply impressed and I wish you all the best and hope that you find all the support you need. I can barely manage my own PhD and life and struggle with living apart from my partner. I struggle with the hours and hours of commute (nearly 6h one way), just so we can spent a weekend together. Struggle with the fact that meetings and groups are planned for Monday morning or Friday afternoon forcing me to travle on weekends – cutting the free time on the weekend in half. Ironically, a support group for women in STEM meets last thing on Fridays once a month. Every time I have to make a choice – support group or my partner. I know that I couldn’t stretch any further, I know that I wouldn’t make it if I needed to take care of a child on top of all that’s going on. I don’t know how you do it, but I wish you all the best. Thank you for this post. I am a single parent to two primary school age children and currently in my second year of a PhD in Work Psychology. I sometimes feel i am the only person trying to juggle the demands of young children, PhD work, trying to attend conferences to get my work out there and getting enough teaching experience to hopefully help with an academic job at the end of it all. It is comforting to hear that there are others out there in the same position. I am very fortunate to have wonderful supportive supervisors who understand my circumstances which helps enormously. I just keep my eyes on the goal and keep chipping away, hopefully teaching my children that hardwork and determination gets rewarded in the end. Best wishes to all the parenting PhD students out there, we are all doing a great job even though i am sure it doesnt always feel that way. I just wanted to add to my earlier comment that completing my PhD seems to have effected my children positively, with one now seriously considering pursuing a research career. I’m still hoping that my ongoing ECR challenges don’t put them off! They were really proud when I finished and my graduation was an amazing experience to share with them. I’m a FIFO partner and have many of the same issues. I think it’s made me very innovative – a washing cycle is a good pomodoro writing session. Paragraphs can be conceptualised while vacuuming – one paragraph per room works for me. Fieldwork in the school holidays (with kids in tow). Data entry on the tablet at the park. But invariably I miss the seminars and out of hours networking at uni, as well as sports days and reading groups at school. I am a single mother of two – my oldest childs father lives is another country and my youngest child was conceived via sperm donation and born in the second year of my PhD. I managed to complete that PhD in the standard (for Australia) 3 1/2 years, and am now juggling the apply for jobs/do casual work/try and publish stuff loop with the two kids. I had limited support, family who took them – only on days when I worked late with a dose of guilt thrown in – and it meant that I feel like I missed out on a lot as a student myself. However none of that matters…. last mothers day, my oldest gave me a card. Under the heading ‘things you love best about mum’ she wrote “she’s so very hardworking”. I am setting an example to both children that you CAN achieve anything you put your mind to – even if you do have bags under your eyes while you do it! Despite I’m still single, I think is a valuable effort from Orla Egan, I’ve just finish my Master and planning to continue for PhD. I’m in urgent to get married, I was in doubt, how would my live be, if I got married before or during my PhD. However, after reading Oral’s post I feel more confident. Thanks for sharing this experience, I always like to learn from others’ live experience. wow. definitely bookmarked this page. I just started my PhD, far far away from home and apart from my son 😦 I plan to bring him with me as soon as possible for sure, despite of me being sooo worried about my capability in raising both. I ain’t no supermum.. Excellent article and reassuring to know we’re not alone and it CAN be done! I am a single parent to 2 beautiful children (3 & 5), I started my PhD in September 2015 and it is slow going. I’m fully self funded and pursuing my PhD part time so work a 4 day week to fund this. I find it difficult making it into the compulsory modules that are part of the course. The dates/times of classes tend to be released only 1-2 weeks before class commence which makes it difficult to work around childcare. I’m lucky to have very supportive parents, without whom I couldn’t complete this. The only way I could afford to do this after I separated was to move in with them with my kids, so I’ve been very fortunate in that respect. Though it is difficult at times despite working hard not to feel like a failure when you can’t afford to put a roof over your children’s head by yourself. I’m told it’s all worth it at the end, so here’s hoping! Well done to all parenting single or supported through their PhD, it’s no mean feat! 1) I started tearing up and getting emotional because YES. 2) My eight year old son engaged me in a complicated explanation of the meaning of his favorite song which was nearly as long as this article. 3) I got distracted from my own struggles as a PhD single parent because I realized that these moments with him are precious and fading away as he gets older, and I don’t want to miss even one. 4) I got emotional about THAT. I can’t believe that have made it into comprehensive examinations (I am in the US). This means that I have completed three years of coursework and after this semester, if I pass my comps, I will become a candidate. During the last three years I went through a divorce, moved house, then my health began to fail dramatically. I was slender and healthy but I dropped 50 lbs. over six months until I was skeletal. At the end of my second year of doctoral studies I ended up collapsing. I saw it coming, but I couldn’t do anything to stop it. I thought, “I have to just keep going on until this kills me.” I did my best. I woke up from a coma in the ICU (Intensive Care Unit) with multiple organ failure due to sepsis. I remained in the hospital for six weeks with a feeding tube. After two emergency surgeries and IV antibiotics with bolus and bolus of fluids I finally began to recover. During that time my son stayed with his father. My 75 year old mother moved across the country to stay with us while I learned to walk again and struggled to get my weight above 100 lbs. Several weeks later, feeding tube just removed, I returned to classes. Now I am working full time out of dire economic necessity. I owe the hospital $25,000 and the vultures circle as I work myself into the grave. I am completing my comps (which amounts to the beginning of the dissertation in my program), and my mother has long returned to her home and life far away. I am healthier than I was last year. I survived. I actually never really stop to honor everything that has happened. I don’t feel sorry for myself, but I wonder if anyone truly understands how hard it is to pull this off. I wake at 4:15 every weekday and go to my job. I don’t get to sleep until after midnight most nights. I wake in my clothes, buried under mounds of books with all the lights on. I am falling behind in my comps now. I don’t have a nanny or babysitter or any family within a day’s drive, other than my son’s father and his mother. He does his part per our legal agreement, but he doesn’t watch our son when I need a break, or when I have a deadline. There are no breaks. It never stops. And yet it is almost finished, I suppose. Are there PhD students sitting in quiet rooms looking out beautiful windows, sipping tea and considering every word carefully as they type? Do they ever think that their colleagues might be standing in the kitchen, trying not to burn dinner while typing and trying to think through the drone and hyperactive music of cartoons and endless prattle? Do they ever think that other might be fighting to hang on to their homes and jobs and even their very life? Thank you for this post. We shall soldier on. Congratulations on your accomplishments!